The Quaker Church in England was among the first private institutions to realize the seriousness of the potato famine in Ireland and to engage in trying to deal with the catastrophe. 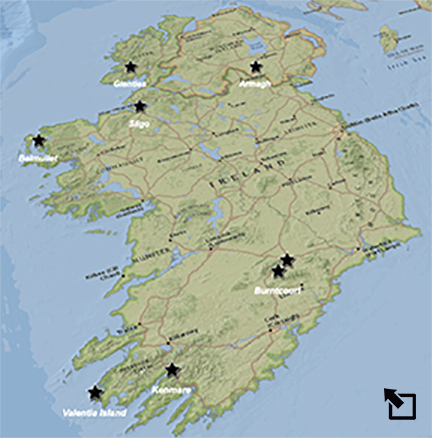 The following activity will introduce you to the devastating impact of the blight, to the geography of Ireland, and to several social and historical issues that compounded the decade long tragedy - issues that you will study in more detail in later lessons. 1) In his conclusion, Bennett describes a geographic division of Ireland in terms of the extreme effects of the famine. Briefly describe this division and make a sketch of Ireland showing it. 2) On the road to Sligo Bennett writes that "the strength of the country is departing." Briefly explain what it was he was describing. 3) Bennett obviously has an eye on the physical character of the Irish landscape. Open the Irish Famine Map at the right and zoom in on the various mountainous regions in Ireland. How high are the five highest mountains you find? Compare your results with classmates and come to an agreement about which five mountains are the highest. 4) Bennett describes a variety of forms of famine relief in his letters. List and briefly describe as many as you can identifying who was responsible for each. 5) During the years of the famine tenant-landlord relationships played a significant role in the lives of the Irish. Compare and contrast at least two different types of landlord behaviors that Bennett encountered in his travels. 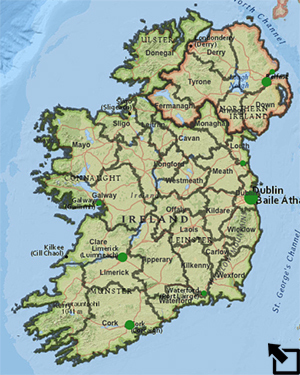 6) Zoom in on the Irish Cities layer in the Irish Famine Map and explore the region surrounding each city. What physical geographic characteristic(s) do most of these cities share? 7) The Irish Cities layer shows the relative populations of several Irish cities in 1841 and 1851. Select to Show Table and arrange the cities in ascending order of population in 1851. What do you notice about the populations of the cities comparing the 1851 populations with those from 1841? 8) Turn on the Irish Famine layer to show the counties of Ireland. Examine the counties in relation to various aspects of the physical geography of the country (rivers, mountains, etc.). Describe which counties you think would be generally most favorable to agriculture. Explain your choices. 1John Crowley, William J. Smyth, & Mike Murphy, editors. Atlas of the Great Irish Famine. New York: New York University Press, 2012.